UPDATE: Draymond Green has been suspended for Game 5 of the NBA Finals. 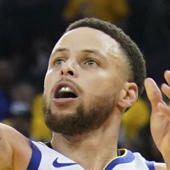 He was retroactively assessed a flagrant foul because he made "unnecessary contact with a retaliatory swipe of his hand to the groin of Cleveland Cavaliers forward LeBron James," which gave him four flagrant foul points in the playoffs and automatically triggered a one-game suspension. Charles Barkley must not be happy about this at all. With Monday's Game 5 of the NBA Finals approaching, the Golden State Warriors are reportedly growing concerned that forward Draymond Green might be suspended for his apparent low blow to LeBron James late in the fourth quarter of Game 4. The Cleveland Cavaliers, meanwhile, are "pushing hard" for the league to suspend him, per cleveland.com's Chris Haynes. One man who is on the Warriors' side: Charles Barkley. Barkley, who has been one of Golden State's most high-profile critics over the last couple of seasons, believes that Green did nothing wrong. During Green's postgame interview on NBA TV on Friday, Barkley praised him for responding when James disrespectfully stepped over him. Barkley referred to that interview when he appeared on Sirius XM's Bleacher Report Radio on Sunday, and then he directly said that Green had the right to strike James below the belt. "I gave Draymond a compliment," Barkley said. "I said, 'You could have played in our day.' Because when a guy steps over you, you have a moral obligation to punch him ... You have a moral obligation. Because that's really disrespectful to step over a guy. You're supposed to pop him in his junk if he steps over you like that. That's a perfectly fine response if a guy does that. "Now, you gotta act like you didn't try to do it," Barkley continued. "I will admit that. You got to act like you didn't mean to do it. But listen man, and I can say it, I told Draymond that: when somebody steps over you, they're doing that intentionally to just like rub it in your face. I mean, they're deliberately trying to punk you in that situation." I would call that an extremely liberal view on this matter, but the main takeaway is that players hate when an opponent steps over them. They will generally not accept this without retaliating in some way. The league, however, does not have a "moral obligation" exception when it comes to groin punching. I'm not sure that this specific type of support helps Green's case for avoiding a suspension.